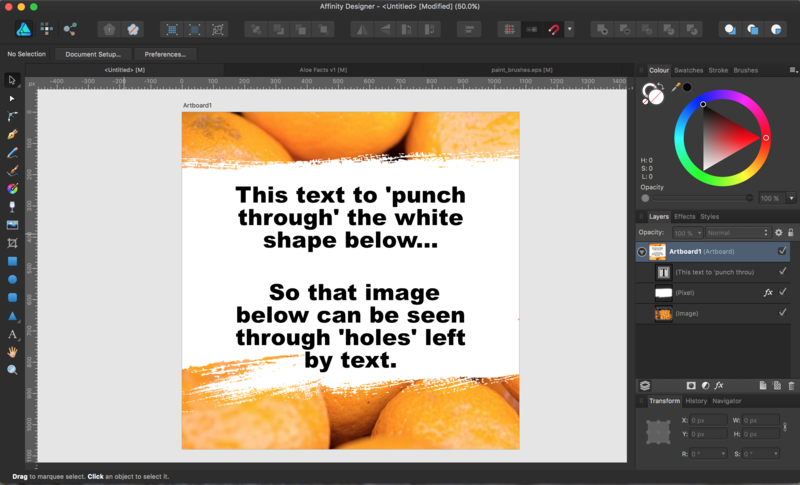 I have just begun to use this software and I am currently reading my way through the Affinity Designer Help articles. However, when I got to the sections on "Layer clipping" and "Layer masking", I got confused. It seems from the help articles that "Layer clipping" and "Vector masking" are the same thing. 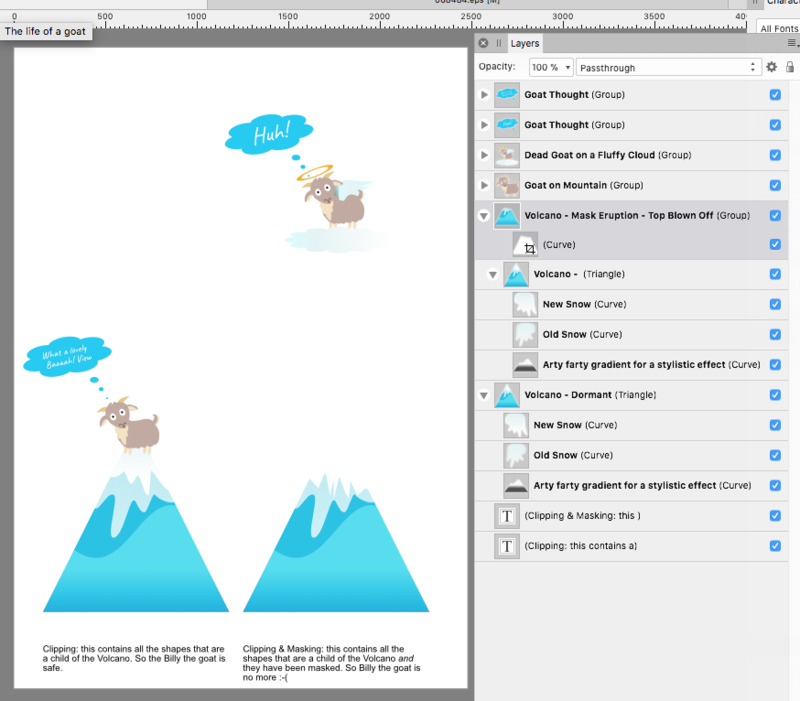 In the Layers panel, drag the object to be clipped on top of the object which is to perform the clipping. The clipped object is nested within the clipping object in the Layers panel. The clipped object has become a child of the clipping object. In the Layers panel, drag the created object entry directly onto the thumbnail of another 'target' object. A thumbnail appears next to the target object indicating that a mask and crop have been applied. Am I just dense or are these two things the same thing? If there is a difference, I want to know what it is and what the different use cases are. If not, I just want to know not to get hung up on this. Thanks in advance for any help that can be provided! 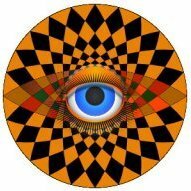 please have a look at my video linked below (Clipping_vs_Masking.mov). In (A.) the pink rectangle (or rather square) gets clipped to the boundaries (path) of the blue triangle, and this is done by making the rectangle a child of the triangle in the layers list. This is called "layer clipping". In (B.) the rectangle acts as a mask applied to the triangle, and this is done by dragging the thumbnail of the rectangle directly onto the thumbnail of the triangle in the layers list. (Note the differences between the blue highlight bars appearing while the list entries are dragged to their respective positions.) Now it is not the rectangle that gets clipped to the boundaries of the triangle, but the rectangle clips (or cuts) parts of the triangle. 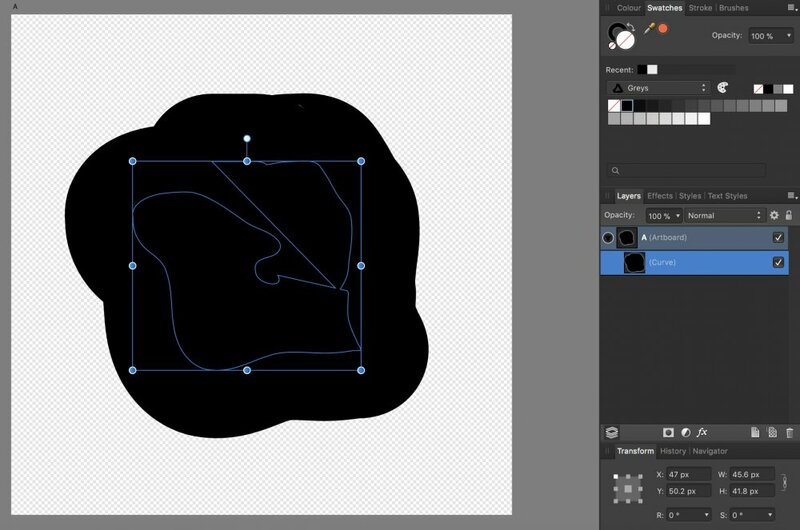 This is called "creating a vector mask". Oh wow! Thank you so much! That was very helpful. In fact, now that I've seen it, it seems kind of obvious. I don't know how I didn't get it before! I would like to do that with text but it only cuts out the first letter of the word. What is the right way to cut out a word from an object? It should cut all the letters simply selecting the background object and the text and performing a subtract operation. Can you post the file, so i can take a look at what's going on? It's working fine here (cutting text from a shape). Are you using the Mac App Store version (1.2)? This is a known bug in the Mac App Store (MAS) version. But it's working fine on the latest beta. If you are using the MAS, convert the text to curves (Layer ▹ Convert to Curves) and then perform the subtract boolean operation. I'm really struggling with a similar problem - hoping you can help. I have a text layer. Under the text layer, I have a shape layer. I'd like the to create a mask so the text layer 'punches through' the shape layer below - therefore leaving a shape with the letters cut out of it. I've followed the tips in this thread but can't get it to work. I've tried swapping the order of the layers. I've followed the video you kindly posted. I'm using v1.4.1 - which I downloaded from the Mac App Store. Please see screen grab attached. 1.  Command-click on the text layer. This will create a "marching ants" dotted line selection around the edges of the text characters. At this point you can hide the text layer, since it won't be needed. 2. Select the pixel layer & switch to the Pixel Persona. 3. Tap the Delete key on the keyboard. 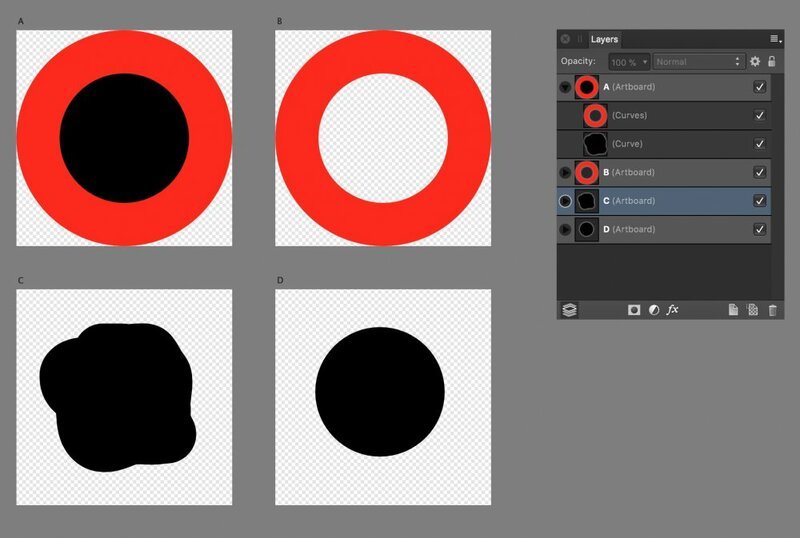 Everything inside the selection will be erased, leaving holes where layer(s) below it will show through. 4. Tap Command+ D to remove the "marching ants" selection. For some projects you might want to experiment with variations on this method. 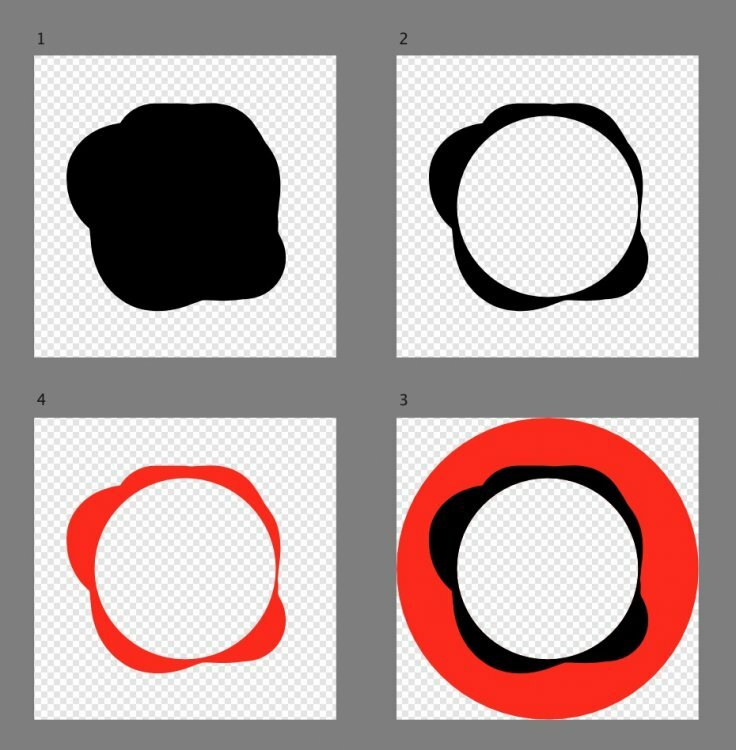 For example, using the Erase brush instead of the delete key in step 3 & varying its opacity, hardness, flow, etc. will produce different effects, or by using the Pixel Persona's Select > Refine ... menu option prior to erasing, you can create soft feathered edges around the holes. a. Do steps 1 & 2 as above. b. Select Invert Pixel Selection from the Select menu. 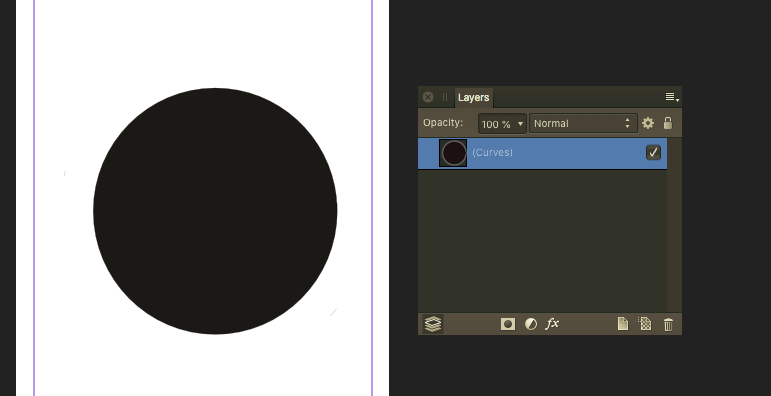 c. With the pixel layer still selected in the Layers panel, click the Mask Layer icon at the bottom of the panel. d. Do step 4 as above to remove the "marching ants" selection. This applies a mask directly to the pixel layer. That may be useful if you want to refine or edit the mask at some point in the future or play with masking effects, or reserve the blend mode for some other effect. Select the text and the pixel layer and group them pressing ⌘ (cmd) + G (or go to menu Layer ▸ Group). 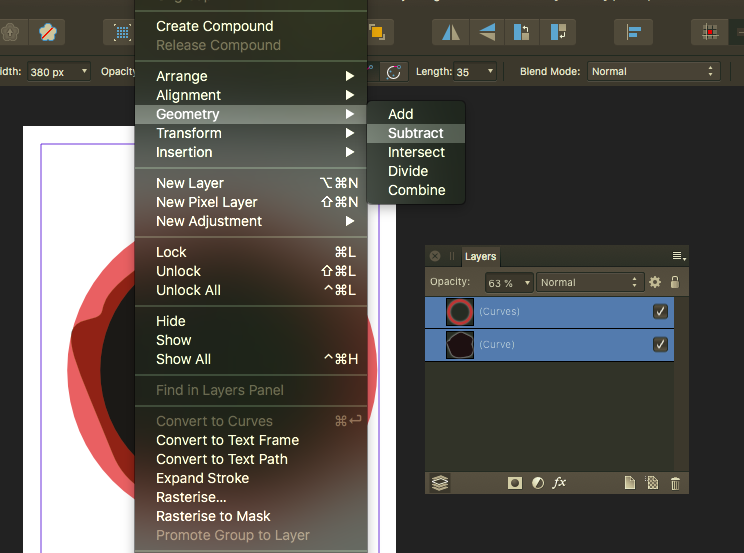 Expand the group in the Layers panel, select the text and set the Blend mode dropdown on top of the panel to Erase. The purpose of the group is to limit the effect of the Erase Blend applied to the text to the Pixel layer(s) inside it. Thanks so much R C-R and MEB - all of these techniques work great! I especially like the Erase Blend technique, as it gives me the opportunity to change the text later, if I need to. You've solved a big problem for me. Thanks again. Finally I got it thanks to the few seconds video - pls share more extremely short clips like that. No, unless you select both shapes and Add or Combine them (boolean operations) so they become a single object. You can align the clipped object inside the clipping object but you can't make it proportional. To align it select the clipped object in the layers panel, then shift-click the clipping object on canvas to add it to the selection. Then use the menu Layer ▸ Alignment (or the combo Arrange button in the main Persona toolbar) to align them. please have a look at my video. I have attached both the project file and a print-ready PDF, in the hopes that this little exercise will be helpful to others. Many thanks for sharing the video! It seems it's not just me that struggles to understand masks & clipping. I've tried all sorts with this simple one and i just can't get it to do what I want. See image below. I have two vector layers on artboard A, the red bit (B) and the black bit (C). All I want is to create D by dropping one layer over the other and masking it, but however i try it just won't do it. 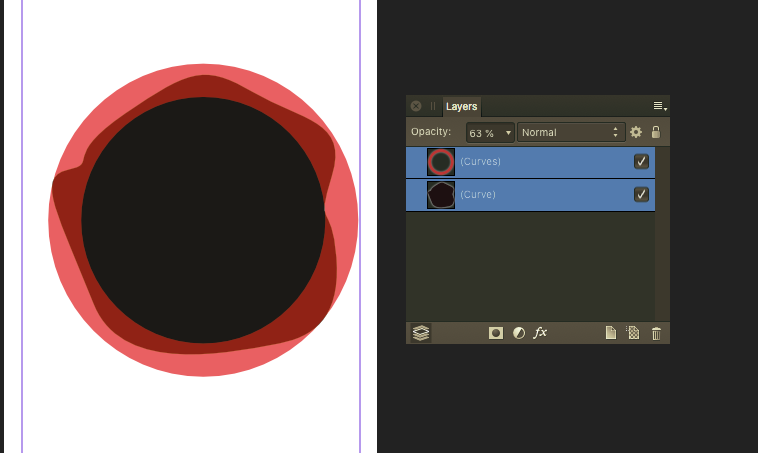 Both layers are vector curves. I'm sure B needs to mask C somehow so only D is visible, but i need to get B to function as a mask. Can someone please put me out of my misery? @firstdefence thanks for your post too, but i'm struggling with the most basic shapes and functions here.. as you will see from my video. is it possible i have a wrong setting somewhere?